Christmas Ornaments Made in USA - Official US Capitol US Constitution Ornament - A Christmas Ornament Co.
One of the oldest and most famous documents in the history of the United States, The U.S. Constitution was adopted on September 17, 1787, by the Constitutional Convention in Philadelphia. The first ten amendments, the Bill of Rights, protect the natural rights of liberty for all people. The U.S. Constitution is the oldest constitution that is still used by any country in the world. The handwritten original, handwritten, document is on display at the National Archives in Washington, DC. 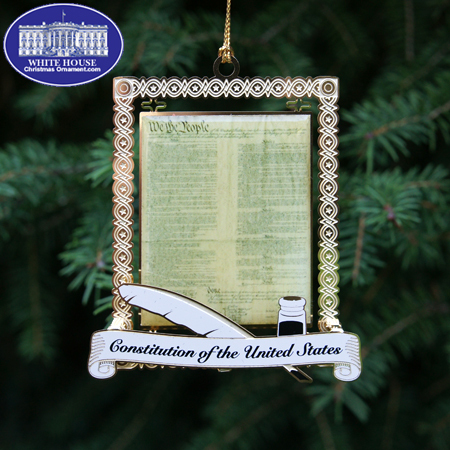 The 2011 U.S. Constitution Document Ornament is handsomely decorated by a 24-carat, gold-finished brass frame.